The Zilker Park Trail of Lights is back on this year after having been cancelled for the past three years for lack of funding. I was so excited that we'd be here this year to see them and was impatiently waiting for the cold weather to return before we went. Last night was to be one of the coldest in a while, so we bundled up our babe and headed out to the park as soon as Gui got home from work. Thank goodness they have convenient shuttles nowadays to transport folks to and from the park because I'm pretty sure we wouldn't have gone if we had to drive in the horrendous rush-hour traffic to get there - not to mention, dealing with a crazy parking situation. 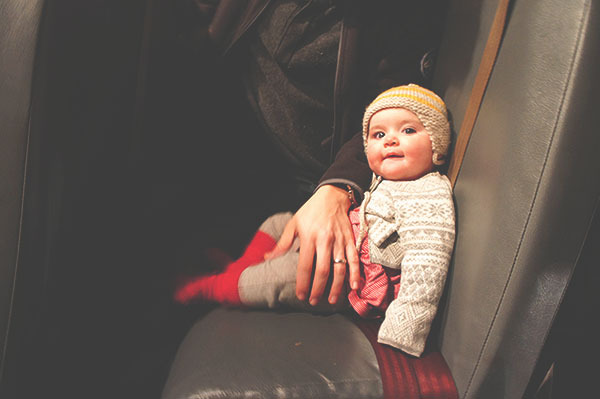 This was Avienne's second time on a bus, and she was totally enjoying the ride sans carseat (meanwhile, I'm freaking out at every bump we encounter). As soon as we arrived [safely] at the park, we hopped off the shuttle, grabbed a hot dog for Gui, a corn dog for me and a hot cocoa for each of us and spent a few minutes gazing up from below the Zilker tree before walking the 1.25-mile trail through a sea of Christmas lights. I think it's been about 10 years since I last strolled through the Trail of Lights, but so little about it has changed since then that I felt like I had visited just last year. It's too bad night falls right around the time that Avienne is ready for bed because it meant that she had to miss out on seeing over half of the light installations (and that I had to carry her for half a mile). Still, though, Gui and I really enjoyed getting a healthy dose of Christmas spirit, and I'm happy to have made a new, lasting memory with my two favorite people. I know I've said it before, but I so love reliving these old traditions for the first time with Gui and Avienne. Sidenote: Between holding a corn dog, hot cocoa and a baby, we didn't have many opportunities to capture the moment on camera. Plus, it's hard to take pictures of Christmas lights at night, and these just don't do the Trail justice.